In the data brief, Datamaran compares the Task Force on Climate-Related Financial Disclosure financial services signatories to other (non-financial services) sector signatories and explores how they disclose on climate change related risks in their annual financial reports. The brief reveals a gap between the two. Twice as many non-financial services signatories report on climate change with a high emphasis compared to financial services. Established in 2015 by the Governor of the Bank of England, Mark Carney in response to G20 request to better understand the financial implications of climate change, The Task Force on Climate-Related Financial Disclosure (TCFD) has been pushing companies to publicly disclose on their climate-related risks and opportunities. In less than three years, the TCFD signatories have accounted for $44 billion in average market capitalization, per company, including the likes of; Diageo, PepsiCo, Unilever, Morgan Stanley, BHP Billiton, Akzo Nobel, Kering, Shell, Burberry, M&S, EDF, Engie, and Qantas Airways. 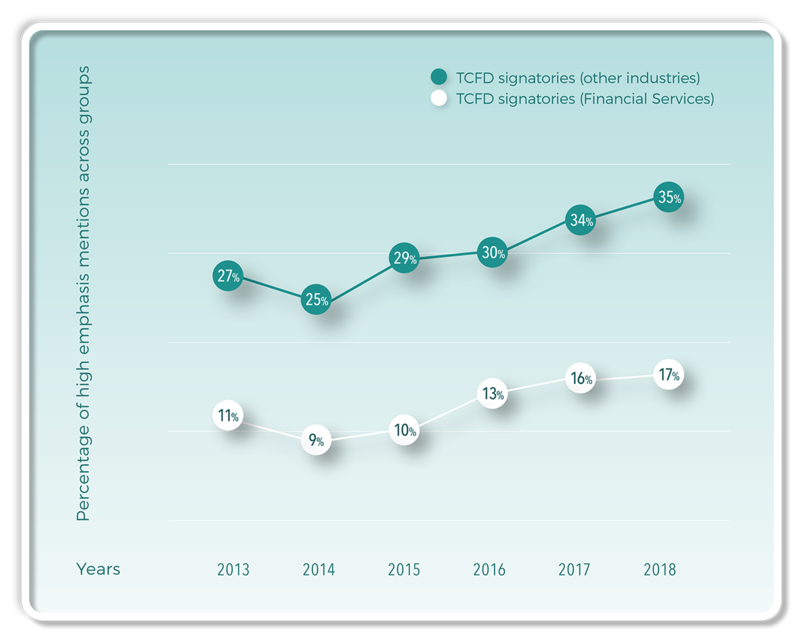 Primarily dominated by financial services, which make up 50% of the Task Force signatories, there are over 200 of the TCFD signatories across all sectors. Coupled with the fact that financial services are one of the biggest sectors in terms of market capitalization, approximately $17 trillion, their potential impact on climate change can be far reaching. Given the initiative’s scale and its potential impacts, the aim of this brief is to analyze how the TCFD signatories have been reporting on climate-related topics for the past five years. The brief compares financial services to non-financial services companies and it explores topics related to Climate Change and Air Quality, such as: Greenhouse Gases, Climate Change and Air Emissions, and the way these were discussed in annual financial reports. The issue of Climate Change and Air Quality has been analyzed through Datamaran’s proprietary Artificial Intelligence. The analysis is focused on financial reports, which takes into consideration the TCFD recommendations focus on implementing climate-related disclosure in financial publications. The research is based on an emphasis given to a specific topic, not looking at performance indicators. Emphasis represents the level of attention a company is giving to a specific topic based on a terminology around each topic. The emphasis levels a company can report to are high, medium, low or no mention. This research is only looking at the high emphasis mentions. Annual dynamics of high emphasis mentions around Climate Change and Air Quality among the TCDF signatories. Further findings include that non-financial services are more proactive in climate change reporting. They started to put more emphasis on climate change in their reports a year before the TCFD recommendations were released, going from 31% in 2014 to 43% in 2015. The study shows that financial services signatories are observed to be more reactive. It was only the year after the TCFD recommendations were introduced that an increase was seen in high emphasis reporting on climate change topics. Three years after the TCFD recommendations were released, the gap between the sectors on high emphasis reporting has been reduced, moving from 31% in 2016 to 15% in 2018. Interestingly, in 2018, financial services saw a 10% drop in high emphasis reporting on greenhouse gases but saw a 14% rise in climate change disclosure. When comparing financial services signatories reporting to their peer group of non-members, the analysis found that the latter maintained a stable reporting with no abrupt increases or decreases in the same year. Finally, air emissions is not a material topic for FinServ signatories, therefore, almost no signatory from that industry reported with a high emphasis on it. Interested in the complete brief? To access the 11-page executive data brief and graphs, please fill in the form on the right side. You will get a detailed overview of the The TCFD Signatories Perspective on Climate Change and Air Quality. We'd love to keep in touch. By submitting this form you agree to receive the latest news, content & updates from us. You can withdraw consent by unsubscribing at any time.